When Emergency Alerts are issued by the National Weather Service they will appear in the space above . 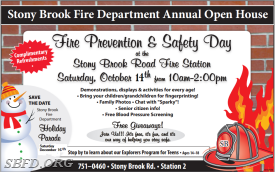 STONY BROOK FIRE DEPT. WOULD LIKE TO REMIND YOU TO CHANGE THE BATTERIES IN YOUR SMOKE DETECTORS AND YOUR CARBON MONOXIDE (CO) DETECTORS. ALSO, LOOK AT THE CO DETECTOR'S EXPIRATION DATE AND REPLACE IT IF NECESSARY. Information To Help Smart 911 Responders. Help us get to the firehouse. When you see a flashing blue light, it is a Fireman or EMT on the way to serve you. Please pull over when you can. We are currently looking for new members to join our volunteer department. Firefighters, EMT's, Paramedics, Fire Police are all needed. All training and equipment is provided at no cost. Your time is all we need. You also can get more information on volunteering from Suffolk County. PLEASE FEEL FREE TO LOOK AROUND. YOUR FEEDBACK IS IMPORTANT TO US! WE WOULD LIKE TO KNOW WHAT KIND OF INFORMATION YOU WANT TO SEE ON OUR WEBSITE. 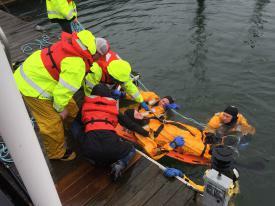 Stony Brook Fire Department has purchased a rescue boat from the Port Jefferson Fire Department. radar, deck mounted water cannon, forward spotlights, and many other features not present in our old boat. 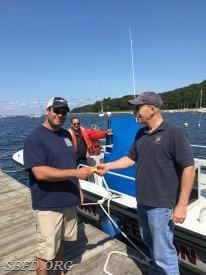 Chief Meringolo (right) hands keys to Lt Hengerly. Ex-Commissoner Callahan in background. The original 'Survivor Tree, in lower Manhattan. The Stony Brook Fire Department received a 9-11 Survivor Tree in a ceremony held at Mt Sinai Fire Department. 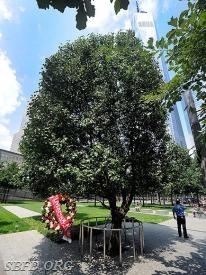 This tree is a seedling of the Survivor Tree located at the site of the World Trade Center. The tree has been planted in front of Station 2 fire house on Stony Brook Road. The Juniors of the SBFD held a car wash on Saturday at Station 2. This is a fund raising event to benefit the Juniors and to clean up Stony Brook's dirty cars. Your visit is important to us!